US President-elect Donald Trump has said German Chancellor Angela Merkel made "one very catastrophic mistake" by admitting more than 1m migrants. He said Mrs Merkel was by far Europe's most important leader, and that the EU had become a vehicle for Germany. 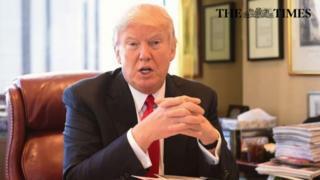 Mr Trump was giving details of his foreign policy goals in an interview with British and German newspapers. He told the Times and Bild his priority was to create fairer trade deals for the US and have strong borders. He said the US had to address its trade deficit with the rest of the world, particularly with China. The emphasis for his administration should be smart trade, rather than free trade, he said. The interview was conducted for the Times by UK MP Michael Gove, who played a key role in the Vote Leave campaign that led to Brexit, and who also has a column in the newspaper. An image of Mr Gove and Mr Trump giving a thumbs-up at New York's Trump Tower, where they met, was shared on Twitter. What will Trump's foreign policy look like? Asked about a possible deal with Russia, Mr Trump said nuclear weapons should be part of it and "reduced very substantially", in return for lifting US sanctions. Turning to the Middle East, he condemned the 2003 invasion of Iraq as possibly the worst decision ever made in the history of the country, and said safe zones should have been created within Syria and paid for by the United States' Gulf allies. In a separate interview with the Washington Post, Mr Trump said he was close to finalising a replacement for President Barack Obama's healthcare programme, the Affordable Care Act. He gave few details, other than saying there would be healthcare for everybody and that costs would be lower. He said he was waiting for his nominee for health secretary, Tom Price, to be confirmed, before unveiling the plan. UK-US trade deals: "We're gonna get something done very quickly"
Nato: It's "obsolete" but "very important to me" and other members should pay "their fair share"
Iran nuclear deal: It's "one of the dumbest deals I have ever seen"
Iraq war: It was "like throwing rocks into a beehive"
Mr Trump also spoke about the UK and Brexit, saying he thought the UK was "so smart in getting out" of the EU. "Countries want their own identity and the UK wanted its own identity," he said. "I think you're doing great, I think it's going great." He predicted that more countries would follow the same path. "I think people want . . . their own identity, so if you ask me ... I believe others will leave." During the interview, the president-elect said he thought Mrs Merkel was the "by far the most important European leader". "If you look at the European Union, it's Germany - it's basically a vehicle for Germany," he said. "I think she made one very catastrophic mistake and that was taking all of these illegals." He linked the migrant issue with the UK referendum vote to leave the EU. "I do believe this, if they [EU countries] hadn't been forced to take in all of the refugees, so many, with all the problems that it . . . entails, I think that you wouldn't have a Brexit. "It probably could have worked out but this was the final straw, this was the final straw that broke the camel's back." He repeated his vow to be tough on immigration into the US. "People don't want to have other people coming in and destroying their country. In this country we are going to go very strong borders from the day I get in," he said. He also stressed that he would "start off trusting both Russian President Vladimir Putin and Mrs Merkel" on taking office, but would "see how long that lasts". Talking about international security, Mr Trump argued that he had said "a long time ago that Nato had problems". "One; that it was obsolete because it was designed many many years ago, and number two; that the countries weren't paying what they're supposed to pay." He said that only five countries were paying what they should into the Nato budget. "Five. It's not much... With that being said, Nato is very important to me." The president-elect was also asked if he would continue to use Twitter after his inauguration, and said he would keep up his habit of publishing streams of messages on the social network. "It's working - and the tweeting, I thought I'd do less of it, but I'm covered so dishonestly by the press, so dishonestly," he said. "I can go bing bing bing . . . and they put it on and as soon as I tweet it out. This morning on television [channel] Fox: 'Donald Trump, we have breaking news'."